To celebrate the launch of Aphotic Realms second issue; Banished I 'm talking to Richie Brown one of the many uber talented authors featured in this magazine. 1) Hi Richie thanks for joining us tell me, who are your favourite authors? For horror and dark fiction it's Stephen King and Chuck Palaniuk, for sheer talent, Tom Wolfe. As a new discovery (for me) Ayn Rand author of Atlas Shrugged. My old favourites include George Orwell, E.F.Benson, and H.P.Lovecraft. 2) What draws you to horror? Can you remember the first horror book or film that you encountered? 3) Have you any upcoming projects? I started writing in late 2015, so am new to all of this. In so far as I do have a project, it is to continue to build a portfolio of stories (horror, weird, bonkers and dark), to see how I fare with submissions to magazines and anthologies, and in the longer term to see if I can write a novel. I have an idea for a dark satire, but need to let it develop. 4) In regards to your story, Henry 1.0, do you think that people are far too reliant upon modern technology? Absolutely, and it is almost impossible not to become reliant and dependent, to the extent that payment for internet access has become another utility bill, like water. I think the bigger issue is the pace of unregulated change, and the unforeseen consequences, such as the bigger use of social media by foreign governments to influence elections. 'Henry 1.0' looks at the potential outcome, and human cost of closer links with advancing technology and artificial intelligence. Richie Brown is an ex-Civil Servant living in Cambridgeshire, England. He is new to creative writing, but enjoys it very much and is drawn to dark themes. 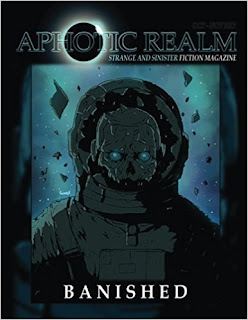 His story 'The Cyclist' was published in Twisted 50 Volume 1; a further story 'Market Research' will appear in Twisted 50 Volume 2, and 'Henry 1.0' appears in the superlative Aphotic Realm Issue 2 'Banished'.